The multipurpose airship Au 30 is designed for long-term flights including low altitude and low speed. The airship can be applied for visual control and patrolling, pipelines and electrical lines control de-mining operations and airspraying, photo and video filming, elite tourism, rescue operations, advertising campaign, etc. The main approaches of the up-to-date lighter-than-air engineering have been realized in the AU-30 airship structure, such as: both vertical or short run take-off and landing, no helium consumption flight, thrust vectoring system, the cutting-edge materials and equipment application. The modern fabric-film material is utilized for the envelopes manufacturing. The AU-30 is a really new generation airship. The instrumentation allows the Au-30 airship to perform prolonged flights either in the day or the night time with the maximum crew comfort level. The unique autopilot system is capable of the airship high-precision guiding by preset routes. The great fuel-weight ratio, along with the high-efficiency power plant makes the record-range flights available for the AU-30 airship. The airship features hyper-manoeurability among the same class airships, thanks to the cross-thrust, thrust reverse and thrust vectoring, particularly at low velocities. Depending on the particular designation of the airship the following versions are possible to turn out basing on the initial AU-30 model – passenger; VIP-salon meant for elite tourism; patrolling with the wide range of equipment aboard, providing all the types of air photography, monitoring, public arrangements safeguarding, exploration activities and the other tasks which could be interesting for the consumer. At the present time the Russian and international certification works are being carried out over the AU-30 airship very intensively. 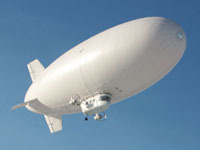 The AU-30 airship already has a wide circle of customers. There are no doubts – the range of application will only grow wider for this type of airship.